Immunostaining of mitotic chromosomes of larval neuroblasts by antibodies directed against specific proteins is a powerful tool for analyzing their distribution in both euchromatin and heterochromatin. This approach is particularly important for the structural analysis of heterochromatin because the high content of repetitive DNA and the absence of meiotic recombination render this material difficult to manipulate by standard genetic and molecular methods. Sensitive chromosome banding techniques have elaborated a cytogenetic map of Drosophila melanogaster heterochromatin (1,2), which is now resolved into 61 distinct bands designated h1-h61 (see Chapter 16). The relationship between these bands and the locations of 30 genetically defined het-erochromatic loci, the major satellite DNA clusters, and 12 different middle repetitive DNA families have been determined (3,4). information about both the molecular composition of different heterochromatic domains and their structural similarities with euchromatic domains. 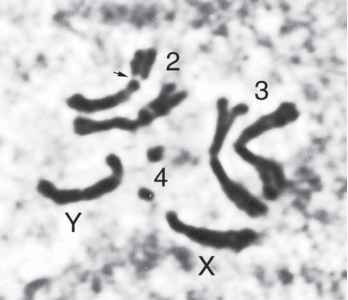 To cytologically analyze the distribution of chromosomal proteins along the mitotic chromosomes, it is necessary to devise fixation procedures that do not alter the protein composition of the chromosomes. 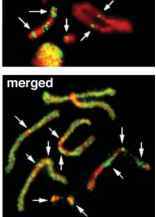 The classical methanol/ acetic acid fixation procedures used on mitotic chromosomes permit one to obtain good chromosome preparations for classical staining, fluorescent banding, and FISH analysis (1,2,4-6), even though they remove a substantial portion of chromosomal proteins. Localization by indirect immunofluorescence requires fixation procedures that not only preserve the protein component of chromosomes but also leave the protein epitopes exposed and recognizable by the specific primary antibody. Therefore, depending on the fixation procedure, two artifactual cases of negative results can arise: the protein has been extracted or the protein is present but not detectable because its epitope(s) is masked. Another case that can arise is that of poor quality immunopatterns. This can depend on the primary antibody or, again, on the fixation procedure used. Here, we describe a series of fixation procedures that we developed for the immunolocalization of several chromosomal proteins. Other protocols for certain proteins have been described by other authors (7,8). We found that all steps of the fixation procedures can be critical for a specific protein, including hypotonic treatments, concentrations of fixative chemicals, incubation times, and modalities of chromosome squashing. We also found cases in which the treatment of fixed chromosomes with DNase I before immunostaining strongly improved the fluorescence intensity of the immunopatterns. In conclusion, we want to stress that for a given protein, it is necessary to develop a fixation procedure that maximizes epitope exposure to the specific primary antibody without affecting the protein's localization. One consequence of these differential fixation requirements is that for several proteins, it is impossible to perform double immunostaining even though primary antibodies produced in different species are available.